Need a quick xgrid to harness the power of multiple processors on your network? This is a long looking entry but that's because of all the images :). 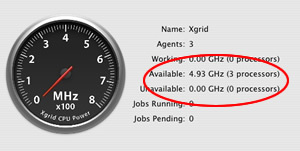 It should take about a half hour to get your xgrid up and running. First you need one Mac running Tiger (OSX) to control the grid. This doesn't need to be a powerhouse Mac as it will be acting as your controller, the only requirement is that the Mac is running OS X Tiger. Start the controller and specify your security settings. 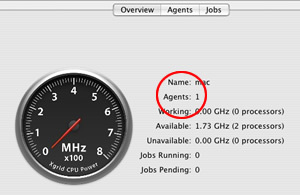 Click on Agents and see that your mac has been added via the Xgrid Admin GUI, we added a dual processor Mac, so we see : 1 agent and 2 processors. Lets setup 2 agents, one for a linux box and one for an XP box, we'll call the agents respectively "box1" and "box2". You will now see 3 Agents. Okay, now onto configuring our agent boxes. cd into the xgridagent directory. hooray! We are connected to the xgrid controller on the Mac. Make sure cygwin is installed on your XP. You now have a working grid running at 7.33 Mhz. Pretty cool. 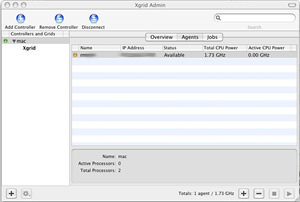 You can add to your grid by adding agents in Xgrid Admin and running xgridagent on as many boxes as you need. 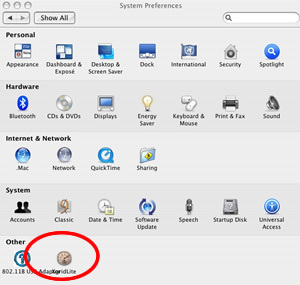 To add Macs to your grid, go to System Preferences > Sharing and start xgrid. Get GridStuffer to give your xgrid a workout. Off the beaten path but worth a search! In the interest of promoting information access, here are a few "off the radar" search engines that do a fine job. Operated by Matt Dwells this is probably the most sophisticated, advanced engine that could be in the "roll your own" family, pretty much a one man show but some major cool features and advanced options make gigablast a very cool and comprehensive search engine, I have a hard time believing you couldn't find what you are looking for there. Try it, you'll like it. This engne is probably the most well known nutch powered search engine currently operating. Mozdex is in beta but who in search really isn't? Beyond promoting open source search, the operators are also looking for new ways to sell advertising to fund the expense of running a search engine, clearly they are thinking forward and also maintain a blog for further conversation. Thats 2 for now! Check them out! JamBot is our attempt to make the search landscape a bit more diverse. Should there be one or two (or three) BIG dogs allowing the fate of information access to rest in the hands of the few or should there be a wide and varied information landscape available to those who have need of information? Can the search market be fragmented, are search habits hard to break? We hope to explore these evolving issues and have a little bit of fun while doing it!